I have always been interested in knowing where my food comes from and how it's grown. Working fulltime with a young family, I have little time for researching this myself, so rely on retailers such as Riverford Organic and Waitrose to trade responsibly and fairly on my behalf. Now working with The Oxford University Shop team, I'm more aware than ever of Fairtrade as well as the ethical supply chain and manufacture across all product categories. I have previously worked with the Copyrights Group who handled the licensed merchandise for Beatrix Potter and Peter Rabbit on behalf of Penguin and Frederick Warne. Owned by Pearson all companies associated through business had to comply with their CSR strategy which included a code of ethical manufacture through to eco best practise in the office. If memory serves correctly, this CSR scheme was one of the first, if not the first, to be recognised in the licensing industry. All licensees were encouraged to sign up to the ethical database called Sedex to which major retailers and brands had already chosen to join and share their factory reports and audits. I had an opportunity to revisit the Sedex website the other day and was really impressed by the number of UK companies that have signed up to this database - ethical trading has caught on through consumer demand if not moral obligation. So with this background and renewed interest, I'm well and truly throwing myself into Fairtrade Fortnight. We've done the first Show Off challenge for the Fairtrade Facebook page and are hoping to do more. We're promoting Fairtrade over Twitter - see our twibbon - on the oushop.com and in the High Street shop. Both the High Street shop and oushop.com stock 100% organic Fairtrade College Hoodies in navy blue that can be customised with any one of the 38 college crests. For those without such a direct association with the university, there is the University of Oxford option which comes complete with a similarly discreetly placed crest. 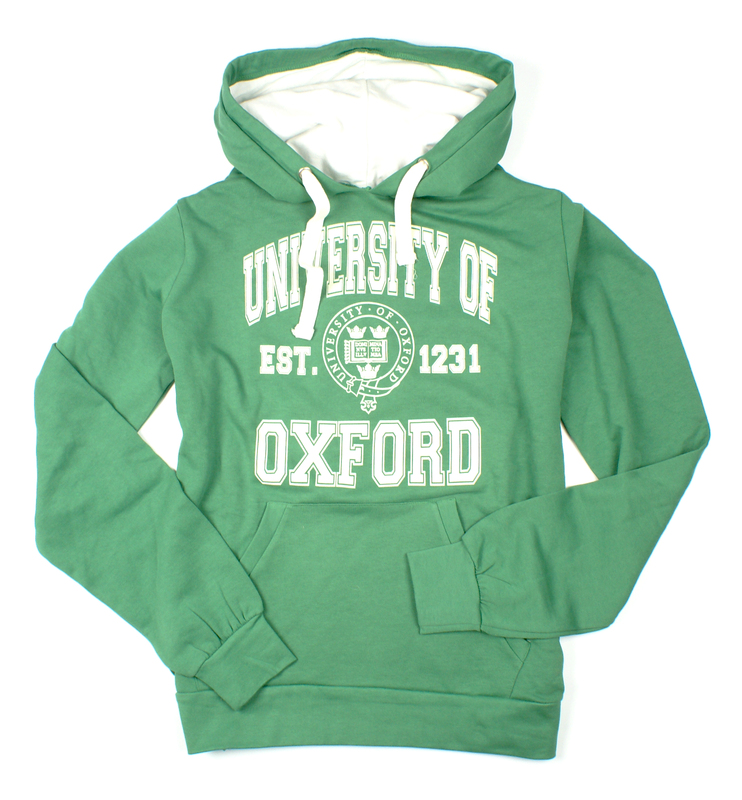 For those more fashion conscience customers, there's also a more ‘out there’ collegiate style Hoodie in 'Spring Green' exclusive to the Oxford University shop on the High Street, which may be just the ticket, particularly as it's Oxford Fashion Week too!